If you would like to show a total in the footer or each page of a report, you may have a problem. Access does not allow the SUM() function in the footer. The way around this is to put a SUM() function in an unbound text box in another part of the report. Choose Properties and set the visible property of the control to No. In the footer, create another control using the "calculation" text box as the ControlSource. The Sum() function, as well as the other aggregate (totals) functions can reference only a field and not a control. When you preview an Access report, you may want to see several pages at one time to examine the layout of the report. You may know that you can do so by choosing View >Pages from the menu bar. However, this technique limits how you view the pages -- you can only view 1, 2, 4, 8, or 12 at a time. 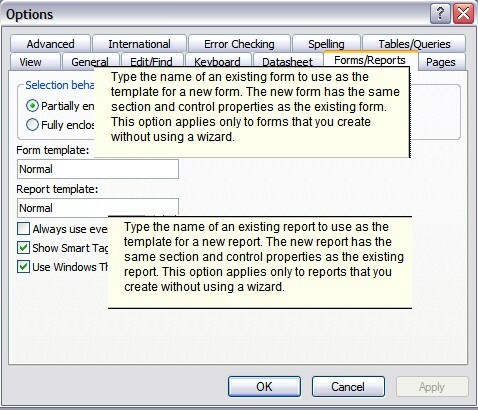 For more control over how the pages are displayed, right-click on the report preview itself, and choose Multiple Pages from the shortcut menu. The default layout grid is 2 x 3 pages. However, if you click and drag with your mouse, you can select a range of up to 4 x 5 pages.